Wolfsburg on Tuesday of December 16 officially announced the signing of China’s young talent Zhang Xizhe (张稀哲) from Beijing Guoan with a two-and-a-half year contract. Zhang, China’s Young Player of 2012, was officially introduced by the Bundesliga side at a press conference in Wolfsburg, which was also attended by club manager Klaus Allofs and coach Dieter Hecking. Due to the increasing cooperation with China and the signing of Zhang, Wolfsburg launched their official homepage in Chinese on Monday. Besides that, the Wolfsburg press conference was broadcasted live in China for the first time. “I am very happy that I can play in such an excellent club of the Bundesliga. And I am ready to do my best,” Zhang, the frist Chinese player to play for the Lower Saxony side and the 10th player from China who joins a German Bundesliga club, said in German at the press conference. The 23-year-old attacking midfielder can play on the flanks as well as in the center. The new arrival received the squad number 29. Zhang, who scored 24 goals in 121 appearances for Chinese Super League giants Beijing Guoan, told reporters that he will travel with the Bundesliga giants to South Africa for training in January. Zhang said his recent goal is to improve the German language, hoping to be integrated into the team as soon as possible and have the opportunity to fight for it. The Chinese youngster will first of all be given the time needed to adjust himself, said Hecking. In his eyes, Zhang has strong competitiveness for a main position, and his fluent German has proved his professional attitude toward work. The “Wolves”, who are standing second in the league, will encounter struggling and relegation-threatened Borussia Dortmund in the 16th round of Bundesliga on Wednesday of December 17. Klaus Allofs, general manager of German Bundesliga club Wolfsburg, said on Sunday of December 14 that the German club are willing to develop young talents, including Chinese star Zhang Xizhe, who has just signed a two-and-a-half-year contract with the club. Zhang, a former Chinese super league club Beijing Guoan’s player, has become only the fourth Chinese to play in the German Bundesliga, but Allofs said it’s not an experiment. “I would not call it an experiment, it is more a careful approach. We can turn to past experience when signing players from South America. You have a good idea that things will work out as both sides have experience with such a transfer,” said Allofs. “With a player from China it is different and not easy to predict. For instance what does it mean, when a player has played a good role in the Chinese league and in his national team and then moves to the Bundesliga? You have to overcome the language barrier, get used to the new culture and the new type of football on a new level. “But we intend to do everything to make it all work out as it is part of our philosophy not only to work with stars, but also with talented youngsters – Zhang Xizhe is now one of them. “We have been looking closely at Chinese football for quite a while now. In his case we have done some intense scouting, our scouts have seen several of his games and we talked with him to get to know his personality better,” added Allofs. Allofs thought the 23-year-old attacking midfielder, who played since 2009 for Beijing Guoan to score 24 goals in 121 appearances, will have a good partnership with team coach Dieter Hecking. Allofs, a former Bundesliga top scorer, said he’s not quite familiar with Chinese soccer, but he believed that China’s football is developing and has great potential as the country has in various sports. The “Wolves” now sit on the second place of the Bundesliga table, nine points adrift of front-runners Bayern Munich, but Allofs said Wolfsburg and other German teams are not in a “hunting game” against Bayern Munich. 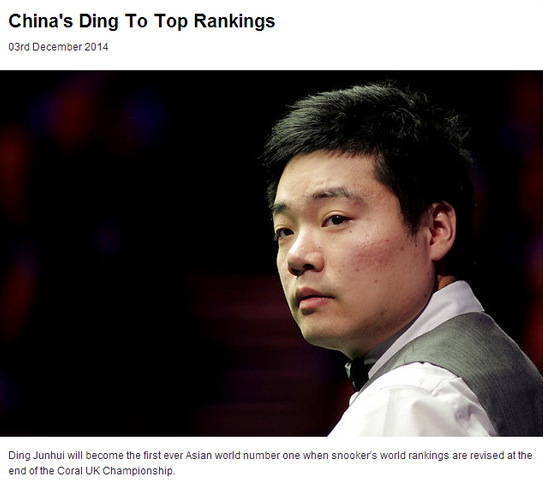 China’s Ding Junhui will become the first ever Asian world No. 1 when snooker’s world rankings are revised at the end of the UK Championship on Sunday of November 30. Ding suffered a shock 6-5 defeat against James Cahill in the last 32 in York on Tuesday night, but has done enough to take over from Mark Selby at the top of the list. Neil Robertson could have regained the No. 1 spot if he had beaten Graeme Dott in the last 16, but the Australian’s 6-5 defeat leaves him in second place. Ding, who won a record-equalling five ranking titles last season, will become the 11th world No. 1 in snooker history, after Ray Reardon, Cliff Thorburn, Steve Davis, Stephen Hendry, John Higgins, Mark Williams, Ronnie O’Sullivan, Robertson, Selby and Judd Trump. The Chinese star said he is very “proud” to become the first ever Asian world No. 1. “I am very proud,” the two-time UK Championship winner told Xinhua. “It’s a great honor as a Chinese to become the world No. 1. He added that the world top billing won’t be any pressure on his preparation for future tournaments. “It makes me work harder,” he said. Chinese multi-Olympic and world swimming champion Sun Yang had failed a doping test and been banned for three months, China Anti-Doping Agency (CHINADA) told Xinhua on Monday of November 24. The star swimmer tested positive for stimulant trimetazidine on May 17 during the national championships. Sun gave up the right to have the B sample tested but defended himself in a July hearing where the experts decided to hand him a three-month ban. Sun said he used the prescription drug Vasorel for medical reasons and had been unaware that its substance trimetazidine was listed in WADA’s 2014 prohibited list. Trimetazidine is able to increase coronary flow reserve and was added to the prohibited list in January 2014. “I have been tested numerous times during years of training and competition and I had never failed one before,” said Sun on Monday of November 24, the Zhejiang native, who was also fined 5,000 RMB (about 816 U.S. dollars) with his national 1,500m freestyle title deprived. The Zhejiang Swimming Association said the provincial association and some related officials were also punished by the Chinese Swimming Association. The Chinese swimming body decided to cut Sun’s ban to three months because the swimmer “proved with sufficient evidence that he did not intend to cheat,” explained Zhao Jia, deputy director of CHINADA. “But his failure to inform the doping control official should be punished all the same,” he added. Both Sun and Zhejiang team doctor Ba Zhen failed to file the therapeutic use exemption when Sun took the test. Sun had been taking Vasorel from time to time since 2008 when he started to suffer heart palpitations, according to CHINADA. Along with Sun Yang, CHINADA also announced six other positive cases in its quarterly report on its official website. “Sun is the most famous athlete in China and is known in the world, which means we need to handle his case very cautiously. This is huge bad news but we will not cover it up,” said Zhao. “We announce positive cases and test statistics in our quarterly reports just as WADA requires,” he added. Zhao said the Chinese agency had been burdened with heavy task — 9,900 doping tests conducted in six months — and spent a lot of time sorting out statistics and waiting for procedures of positive cases to close. “That’s why we did not release the reports for the second and third quarters until now,” he said. The Chinese Swimming Association (CSA) said on Tuesday of November 25 that they believe in Sun Yang’s innocence although the star swimmer failed a doping test in May and had consequently been banned for three months. The multi-Olympic and world champion tested positive for stimulant trimetazidine on May 17 during the national championships. CSA said in a statement which was handed out to a dozen of Chinese reporters waiting at the CSA building on Tuesday morning that Sun proved with sufficient evidence in July’s hearing that he was not aware of the substance was prohibited and took the prescription drug Vasorel to treat a heart condition. “Sun took the drug without an intention to improve his result, but both he and the Zhejiang swimming association (which Sun belongs to) had made mistakes,” said the statement. Sun’s 1,500m freestyle title at the national championships was stripped and he was also fined 5,000 RMB (about 816 U.S. dollars). The Zhejiang swimming association and some related officials were also punished by CSA. “We believe Sun did not intend to cheat,” said Xu Qi, team leader of the Chinese national swimming team. 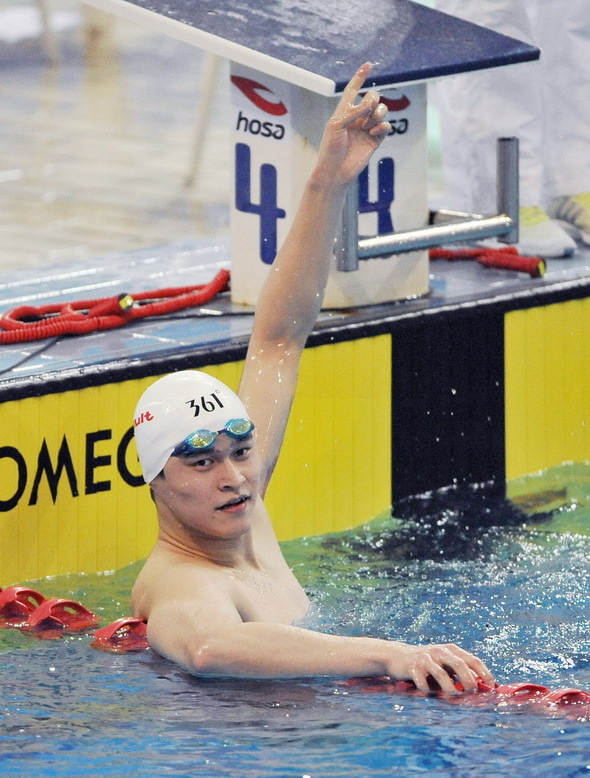 “Sun Yang is an excellent swimmer and his good results came from his talent and hard training. Xu also said that the punishment for Sun was reasonable. “The punishment was in accordance with related rules and reasonable,” he said. According to China Anti-Doping Agency (CHINADA), both Sun and Zhejiang team doctor Ba Zhen failed to file the therapeutic use exemption when Sun took the test. Sun had been taking Vasorel from time to time since 2008 when he started to suffer heart palpitations. Trimetazidine is able to increase coronary flow reserve and was added to the prohibited list in January 2014. Sun took to social media on Monday saying he didn’t intend to cheat. “I have been tested numerous times during years of training and competition and I had never failed once before,” Sun said on his Weibo account. Xu admitted Sun had been under a lot of pressure since the positive test. The three-month suspension ended on August 17, before Sun’s participation in the Incheon Asian Games in September, where he won three gold medals. Association (WTA) Finals in Singapore’s Art Science Museum on October 19, 2014. Li Na, the world famous Chinese tennis player who retired from the sport last month, said she misses her tennis friends “off the court”, and will not go back to play tennis, in a press conference during the ongoing WTA World Tour Finals in Singapore on Sunday of October 19. Li, who is appointed as an official ambassador for the tournament by the Women’s Tennis Association (WTA), attended the press conference with the other eight top players who will be competing for the tournament on October 17 – 26. Talking about life after retirement, the 32-year-old former top player said she feels “pretty nice” having no schedule, adding that the biggest surprise she had during the last month was the Golden Week, a seven-day holiday in celebration of the national day. “I’m already 32,” said Li, “I think I should take care of my family right now, because last 32 years I tried my best on tennis court.” But as a tennis fan, she said she will always enjoy the game. Li’s schedule in Singapore are packed with multiple activities. She will meet with fans at the WTA Fan Fest and also participant of the Under-14 and Under-16 Future Stars events, which feature players from 12 countries across Asia-Pacific. Li will also be at the opening ceremony of the main tournament on Monday, which is the first time in WTA history the tournament held in Asia. The draw made on Saturday put the top two seeds Serena Williams and Maria Sharapova as the headliners in the Red Group and White Group, respectively. Williams will face Simona Halep of Romania and Eugenie Bouchard of Canada along with former French Open Champion Ana Ivanovic of Serbia, while Sharapova’s opponents will be in-form Wimbledon Champion Petra Kvitova of the Czech Republic, Agnieszka Radwanska of Poland and former world number one Caroline Wozniacki of Denmark. Another highlight will be the top pairing of Peng Shuai and Hsieh Su-Wei, who will seek to defend their doubles title here despite they have announced they split after losing in the last 16 of the U.S. Open. Fourth seed Maria Sharapova reached the second round of the China Open in Beijing on Sunday of September 28, and she decided to put romance to the second place, although her boyfriend Grigor Dimitrov plays here too, facing Fernando Verdasco in the first round. Sharapova beat Kaia Kanepi 6-4, 6-1 in one hour and thirty minutes. As the runner-up in 2012 China Open, the Russian is touched by the enthusiastic Chinese fans. “The first thing I notice is how many great fans I have here. They’re following me from practice to the matches, all of them with different signs and pictures. It’s always nice to play in front of them.” Sharapova said. Her boyfriend Grigor Dimitrov also plays as the fifth seed here, and he will face the first opponent Fernando Verdasco on Monday of September 29. Dimitrov is satisfied with his performance this year and climbed to the eighth place, the personal highest rank. At the press conference on Saturday the Bulgarian expressed his desire to visit the Forbidden City in Beijing. When the media asked about their plan in Beijing after the competition, the 27-year-old Sharapova said both of them will focus on the tournament right now instead of going to some attractions in Beijing. “Right now is not really the time for those attractions or things to see. It’s our workplace and we’re trying to make the most out of it.” She said. China’s Peng Shuai, who reached US Open semifinal this month, suffered an upset defeat in her first match after the US Open at the inaugural Wuhan Open as she lost to German player Mona Bathel 6-2, 7-6 (1) on Monday of September 22. Peng’s service games were broken twice in the first set and let the opening set slip away in 2-6. Peng, who pulled herself together and played more aggressively in the second set, successfully took advantage of her only break point of the whole match at the fourth game and established a hopeful rally match by leading 4-1, but the German refused to go into decider after she returned a break in the seventh game and forced the set into tiebreak. In the tiebreaker, Peng earned the first and only point in tiebreaking after Bathel hit the ball down the net. Bathel then scored the next five points in a row as Peng made a double fault and Bathel rushed up the net to hit a powerful winner. After Peng made two consecutive backhand unforced errors, Bathel won the tiebreak 7-1 and advanced into the second round. Bathel will next play sixth seeded Eugenie Bouchard, who reached the final at Wimbledon Open and semifinals at Australia and French Open this season. Bathel had produced eight break points and converted three of them in the match against Peng’s single. Peng recorded her personal best singles performance this month at the Grand Slams, reaching the last four at the US Open, but failed to extend her momentum at the Wuhan Open. “There are many matches to play at the WTA tour, and you can’t expect to do good every time,” said Peng. “Before this year’s US Open, no one knows how far I can go. You can know the result only after you’re there, so I can’t tell you what’s wrong here. Peng was forced to retire at the US Open semifinal when she faced Danish former world No. 1 Caroline Wozniacki as she was troubled by heatstroke and convulsing. “After the US Open, I took a week to adjust my body and take a rest before I came back to train, so I can’t say I came here unprepared. “Fans here are so great. They cheered me all through the match and I’m so thankful for their support,” added Peng. Peng seemed irritated when she was asked a question about taking up the place left by the retiring twice Grand Slam champion Li Na, a Chinese tennis icon. “When I was in New York (US Open), more and more people came to me and compared me to Li Na a lot of times. It seems I’m living in Li Na’s shadow,” she said. 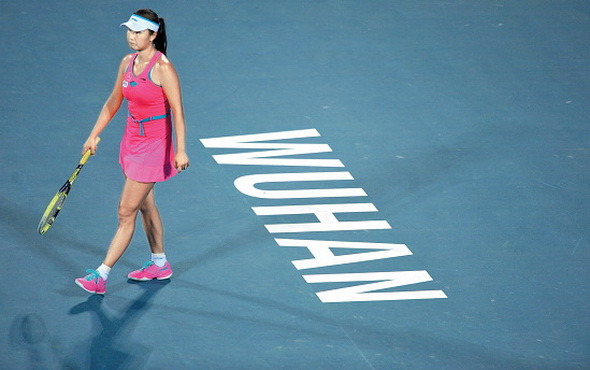 “When I came to Wuhan Open, some began to ask ‘how do you feel about Li Na’s retirement’. Suddenly I feel I’m tired. Why it’s always Li Na that is mentioned in my life, in my matches. “I said many times that I’m tired of being asked about Li Na, but it seems no one has really listened to what I said. China’s first and only two-time Grand Slam winner Li Na waved a tearful farewell to professional tennis in Beijing on Sunday of september 21, two days after she posted a retirement letter on the internet. 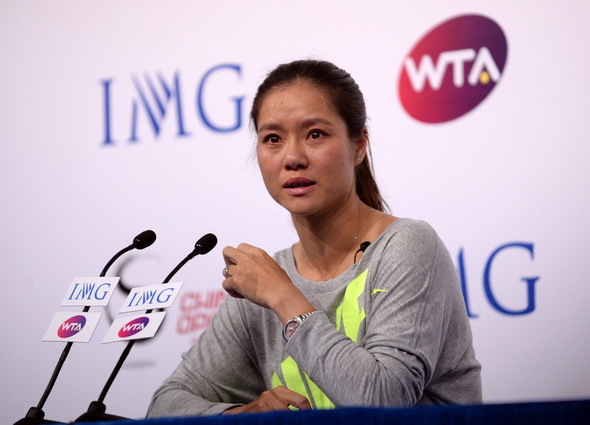 Li was choked with emotions right after her opening remarks at her retirement press conference at Beijing’s national tennis center “Diamond” where the China Open is slated for September 21-October 5. “Thank you for you all coming here so I can have a chance to say goodbye face to face,” the French Open and Australian Open winner said to a roomful of reporters. Li already made known her retirement from professional tennis on Friday of September 19 through a letter on her personal microblog, a Chinese equivalent to Twitter. She cited knee injuries as her reason in the letter to quit her 15-year career which brought her two Grand Slam titles to make her the first-ever Asian to achieve the feat as well as seven other WTA titles. She also made her way into the 2011 and 2013 Australian Open finals. “I believe retiring as a world top 10 player is a rare choice, but my body can’t bear the pressure of high-level competition any more so I made the decision last weekend,” said the 32-year-old who just had the fourth knee surgery in July. “It has been more difficult in making the decision than playing in a Grand Slam,” she added. Li quit while her hometown Wuhan is holding the first ever WTA event. Despite her reluctance to hang up her racket, Li was satisfied with her career. “I am satisfied and proud about what I have achieved. It is the best time to quit because I don’t have any regrets,” she said. Li’s retirement will leave a huge hole for the Chinese tennis which is yearning for its next superstar. But Li said she had faith in the future of the sport in China. “I can tell you seriously that I am very optimistic about the future of the sport here,” she said. “Things are different now. Young Chinese players have more chances to face world-class athletes,” she said. Besides her faith, Li will actually do something to promote the sport. One of her plans is to open the Li Na Tennis Academy, which will provide scholarships for the future generation of Chinese tennis stars. “I will try my best to promote tennis and help young players with my tennis school,” she said. Spending more time with her family will be another important thing to do after Li’s retirement. “I always felt bad for not being with my family and friends more. I will have some rest and spend more time with them in the next couple of months,” she said. As a happily married woman, Li also considered starting a family of her own. “Children should be a part of my life and I want to have children,” she said. China’s first and only Grand Slam winner Li Na formally announced her retirement on Friday of September 19, leaving Chinese tennis yearning for the next superstar. Li, 32, made the announcement on her microblog account, the Chinese equivalent to Twitter, a day after rumors about her leaving already were spread all over the Internet and social media. Li called 2014 “one of the most significant years” in her career and her life, but it was also a year “filled with difficult moments”. “This year was full of amazing highlights, which included winning my second Grand Slam singles title at the Australian Open and sharing the extraordinary experience with my country, my team, my husband and my fans.” Li wrote in a farewell letter on her microblog. Experiencing ups and downs in 2012 and 2013 following her 2011 French Open triumph, Li found the top of her game again this year, bagging a second Grand Slam title in the Australian Open. “The task of finally making a decision to hang up my racquet felt a lot more difficult than winning seven matches in a row in the Australian heat,” said the Wuhan native who quit tennis on the opening day of the WTA event in her hometown Wuhan, capital city of Hubei Province. Li’s retirement came as a surprise but an understandable decision. Speculation has been rife since she pulled out of the U.S. Open and other hard-court tournaments because of knee injuries that flared up in July. The tenacious player eventually surrendered to recurrent knee injuries that had bothered her entire career. “The black brace I wear over it (the right knee) when I step on the court has become my tennis birth mark. And while the brace completes my tennis look, the knee problems have at times overtaken my life,” she said..
“It took me several agonizing months to finally come to the decision that my chronic injuries will never again let me be the tennis player that I can be. Walking away from the sport, effective immediately, is the right decision for me and my family.”. “After four knee surgeries and hundreds of shots injected into my knee weekly to alleviate swelling and pain, my body is begging me to stop the pounding,” she added. Her husband Jiang Shan told a Hubei newspaper that Li is currently receiving treatment on both her knees in Germany and will fly back to Beijing to attend a news conference on Sunday. Looking back at her playing career, Li could leave without regrets. “I have no regrets. I wasn’t supposed to be here in the first place, remember? Not many people believed in my talent and my abilities, yet I found a way to persevere, to prove them (and sometimes myself!) wrong,” she said. Starting up as a badminton amateur at five, Li turned to tennis and joined the ITF tour in 1996, the year her father passed away. Li soon made her name as a promising star in the country, winning the national youth title a year later before she began to play in the WTA tour in 2000 but suddenly dropped the sport to become a journalism student in Huazhong University of Science and Technology. In 2004, she came back from two years of retirement and lifted her first ever WTA title in Guangzhou. Since then, she had been on the track of recording breaking, fighting into Wimbledon last eight in 2006 to become the first Chinese ever going this far at any Grand Slam event. The real breakthrough came in 2011 when she won the first Grand Slam title at French Open for Asia. “I’ve succeeded on the global stage in a sport that a few years ago was in its infancy in China. What I’ve accomplished for myself is beyond my wildest dreams. What I accomplished for my country is one of my proudest achievements.” she concluded. With her achievements and controversial personality, Li will be missed as a unique and accomplished tennis great in China. [ The WTA Tour website dedicated headline stories to Li, who gave a huge push to tennis in the country of 1.3 billion people. “Li Na has been a fun, powerful, and wonderful player on the WTA tour and, along with her fans, I am sad to hear that she has retired. In addition to her amazing tennis abilities and her warm and humorous personality, she is a pioneer who opened doors to tennis for hundreds of millions of people throughout China and Asia,” WTA Chairman Stacey Allaster said about the cover girl for last year’s Time Magazine issue which listed her among the world’s 100 most influential people. The Chinese tennis association thanked Li for her contribution and gave her the best wishes although the two parties were not always on good terms. Li once criticized the association for “unfair distribution of competition bonus” and refused at times to be labeled as “playing for the country”. Li’s open letter on the microblog attracted over 70,000 comments and 150,000 forwards within five hours after her announcement. “I am sad just to think about you leaving the court,” said one net user Stupidboy. “Goodbye, Na. You will always be the pride of China,” said Wryuan_chan. As Li waved farewell to professional tennis, China lost another high profile figure that enjoyed international fame. Former NBA center Yao Ming put an end to his playing days in 2011. 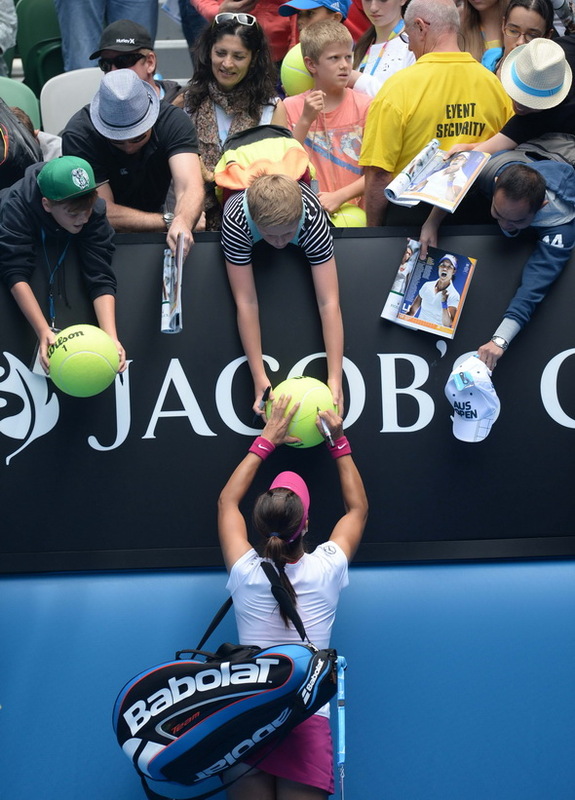 As far as tennis is concerned, one may wonder when next “Li Na” will show up or ever will. Peng Shuai, four years younger than Li, reached her career peak this summer — the semifinals of the U.S. Open — and raised Chinese’ fans expectations on her. 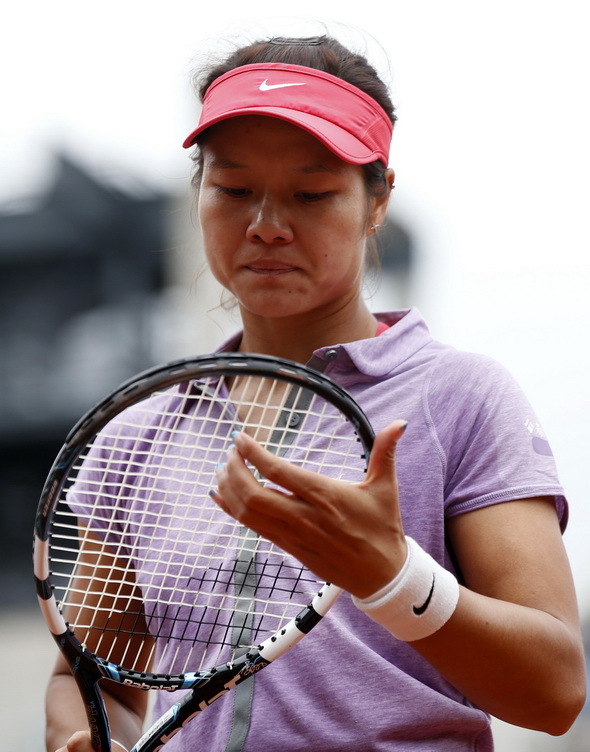 Veteran Zheng Jie, 31, focuses more on doubles than singles while third highest ranked Zhang Shuai, world No. 33, has yet to overcome the first round at any Grand Slams. Also playing in the WTA tour are Zheng Saisai, 20, and Wang Qiang, 22, who both linger outside the world top 100. 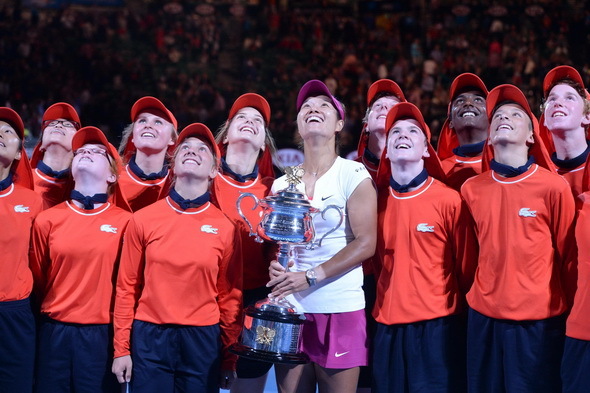 “We surely don’t like to see a big gap between Li Na and her successors. Even though there is no player as outstanding as she is, we are very happy if we can have 10 players stay in the top 100 in the future,” said Chinese women’s tennis coach Wang Peng. French Open tennis championship at the Roland Garros stadium in Paris, on June 4, 2011. China’s first and only Grand Slam winner Li Na formally announced her retirement on Friday, leaving the Chinese tennis yearning for the next superstar. For close to fifteen years, we’ve been a part of each other’s lives. As a tennis player representing China on the global stage, I’ve trekked around the world playing hundreds of matches on the WTA tour, for China’s Fed Cup team, at the National Games and at several Olympic Games. You’ve always been there for me, supporting me, cheering me on, and encouraging me to reach my potential. 2014 has become one of the most significant years in my career and my life. This year was full of amazing highlights, which included winning my second Grand Slam singles title at the Australian Open and sharing the extraordinary experience with my country, my team, my husband and my fans. It was also a year filled with difficult moments, such as having to deal with the inevitable – making the decision to end my professional tennis career. After four knee surgeries and hundreds of shots injected into my knee weekly to alleviate swelling and pain, my body is begging me to stop the pounding. My previous three surgeries were on my right knee. My most recent knee surgery took place this July and was on my left knee. After a few weeks of post-surgery recovery, I tried to go through all the necessary steps to get back on the court. While I’ve come back from surgery in the past, this time it felt different. One of my goals was to recover as fast as I could in order to be ready for the first WTA tournament in my hometown of Wuhan. As hard as I tried to get back to being 100%, my body kept telling me that, at 32, I will not be able to compete at the top level ever again. The sport is just too competitive, too good, to not be 100%. Winning a Grand Slam title this year and achieving a ranking of World No.2 is the way I would like to leave competitive tennis. As hard as it’s been to come to this decision, I am at peace with it. I have no regrets. I wasn’t supposed to be here in the first place, remember? Not many people believed in my talent and my abilities, yet I found a way to persevere, to prove them (and sometimes myself!) wrong. I’ve succeeded on the global stage in a sport that a few years ago was in its infancy in China. What I’ve accomplished for myself is beyond my wildest dreams. What I accomplished for my country is one of my most proud achievements. In 2008, there were two professional women’s tennis tournaments in China. Today, there are 10, one of them in Wuhan, my hometown. That to me is extraordinary! Serena Williams, Maria Sharapova and Venus Williams – with thirty Grand Slam singles titles among them – are coming to my hometown to play tennis for the fans of China! Just as I didn’t think I could ever be a Grand Slam champion, never in my wildest dreams did I imagine that some of the best female athletes in the world could play tennis in Wuhan, in my backyard. My contributions to the growth of the sport in China are very special to me. But I don’t want to stop here. Together with IMG, my management company, we are putting together various plans on how we will continue to grow the sport of tennis in China. These plans include opening the Li Na Tennis Academy, which will provide scholarships for the future generation of Chinese tennis stars. I will also stay involved in the Right to Play, an organization dedicated to helping underprivileged children overcome challenges through sport. My philanthropic work will expand in scope as I continue to dedicate myself to helping those in need. What was once just a dream in China today is a reality. On a personal side, I look forward to starting a new chapter of my life, hopefully having a family and reconnecting with those I did not have the luxury of spending a lot of time with while playing. I can’t wait to revisit all the amazing places I played tennis in and see the world through a new set of eyes. I look forward to slowing down and living my life at a new, slower, relaxed pace. Tennis is an individual sport and as players, our job is to spend a lot of time focusing on ourselves. But no player can ever become a champion alone and nobody knows this better than me. There isn’t enough space here to thank everyone who has travelled on my journey with me and contributed to my success. But I must thank those that have stuck with me through the highs and the lows and have helped me become the person that I am today. My mother — for your never-ending support. Through the laughs and the tears, you’ve always been there for me. My father — you were taken away from me way too early and I haven’t been the same since. You’ve remained the sunshine in my life and I am who I am because of you. Jiang Shan — you’ve been by my side for 20 years. You are my everything and I am grateful to have shared my life with you. My first coaches Ms. Xia Xiyao and Ms. Yu Liqiao — for putting me on the tennis path. Madame Sun and the Chinese Tennis Association — thank you for being trailblazers for tennis in China. Mr. Hu Dechun and the Hubei Sports Bureau — for understanding me and supporting me through the years. Women’s Tennis Association — for your passion for women’s tennis and hard work growing it around the world. Mr. Chan Hongchang — for supporting me when I first decided to become a professional tennis player in 2008. You helped me make up my mind. Thomas Hogstedt — for introducing me to professional tennis. Michael Mortenson — for helping me win my first Grand Slam. Carlos Rodriguez — for pushing me beyond the limits I thought I could reach. Alex Stober — for taking care of me all of these years and pulling me together when I was falling apart. Erich Rembeck and Johannes Wieber — for finding a way to make me pain free, over and over again. Fred Zhang and the Nike team — you’ve been my guiding light, my support system and my biggest cheerleader. I will never forget it. To Max Eisenbud and the entire IMG Team — for being the best management company in the world and for taking care of me every day. To all the sponsors that have supported me through every stage of my career. To my relatives, friends, and everyone who has helped me throughout my career – for always being there for me and for your never-ending support. To my fellow tennis players — for being a part of my journey all of these years. I have so much respect for all of you. To everyone in the media who’s covered my career and helped the growth of tennis in China and around the world. To the amazing tennis fans around the world — for your unyielding support of our sport and for playing every tennis match along with me. And lastly, to tennis fans in China — for getting on the bandwagon and staying on it! I am grateful to each and every one of you for pushing me to be my best, embracing me and loving me unconditionally. There is no limit to how far we can take the sport of tennis in China, together. When I started playing tennis, I was just a neighbourhood kid with an afterschool hobby, not realizing what magical journey lay ahead of me. If I only knew what a vehicle the sport of tennis, along with my success, would become for my beloved China. While my journey hasn’t been easy, it has been rewarding. I’ve seen change happening in front of my eyes, young girls picking up tennis racquets, setting goals, following their hearts and believing in themselves. I hope that I’ve had the opportunity to inspire young women all over China to believe in themselves, to set their goals high and pursue them with vengeance and self-belief. Halep of Romania at US Open Tennis Championships in New York, on August 30, 2011. 2000 – Li Na took part in the Sydney Olympic Games but failed to make the second recond. 2001 – Li won both the women’s singles and doubles as well as the mixed doubles at the Universiade in Beijing. 2002 – Li had announced retirement in 2002. 2004 – Li came back and won her first WTA title at Guangzhou in 2004 and made top 100 debut on October. 2005 – Li made top 50 debut on February. She missed Wimbledon for Chinese Natonal Championships. 2006 – Li became the first Chinese to make the quarterfinal at Gland Slam and she cracked top 20 in WTA. 2008 – Li won her second WTA title at Gold Coast in January. She finished forth at the Beijing Olympic Games. 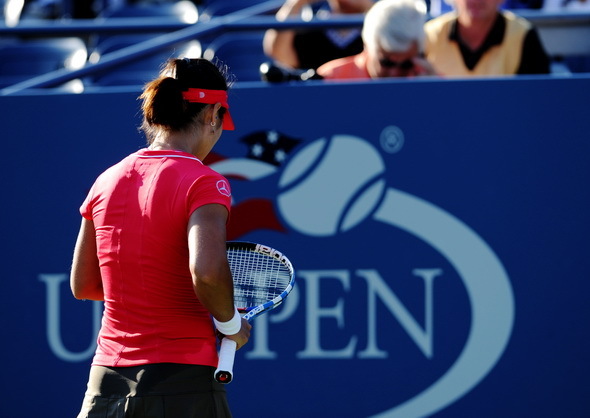 2009 – Li made her first quarterfinal at the US Open and ranked 15th in WTA. 2010 – Li made her first Gland Slam semifinal at Australian Open. Her rank also rose to 10th. 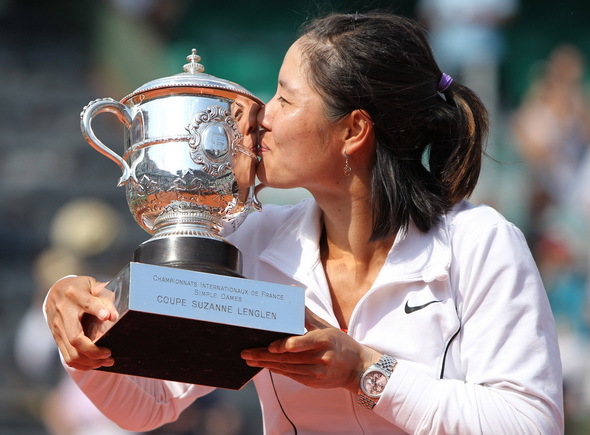 2011 – Li became the first Asian to be a Gland Slam finalist at Australian Open and became the first Asian to win a Gland Slam title at French Open. She ranked forth at WTA. 2012 – Li failed to make the second round at the London Olympic Games. 2013 – Li made a historic top 3 in WTA rankings. She was the runner-up in WTA Championships. 2014 – Li won her second Gland Slam title at Australian Open. She ranked second in WTA in February. Li announced retirement on Friday of Seaptember 19. While Wuhan is hosting its first ever WTA premier-level tournament, Li Na, unquestionably the biggest reason for Chinese fans to watch it, announced retirement on Friday of September 19 due to persistent knee injuries, which put an end to Asia’s most successful tennis career. “It’s just like the heartbeat of Chinese tennis paused for a moment,” said a local fan who showed a photo of his ticket for the Wuhan Open on Sina Weibo, China’s Twitter-like social networking site. “I had previously thought Li Na would secure a top-three finish in this home tourney and we would all cheer for her,” said Xia Xiyao, the coach who introduced a six-year-old Li to tennis in Wuhan in 1988. Yi Guoqing, the event director of the Wuhan Open, however, tried to play down the impact Li’s absence would have on the tournament, saying “such uncertainties do exist in international competitions” and people who love tennis would be able to see top players like Serena Williams as well. Had it not been for Li, China’s only two-time Grand Slam-winner, sports authorities in her hometown would have never imagined hosting a top-level event, with Serena Williams, Maria Sharapova, Simona Halep, Petra Kvitova, Agnieszka Radwanska, Angelique Kerber, Eugenie Bouchard and Jelena Jankovic among the star-studded line-up. “I’m sorry to see Li Na retire right before the Wuhan Open, but I know it must have been difficult for her to make the decision,” said Hu Dechun, chief of Hubei Provincial Sport Bureau. Tennis was once considered an elite sport in China. For the relatively high costs players have to face for rackets and court fees, it is much less popular than table tennis, basketball and football. 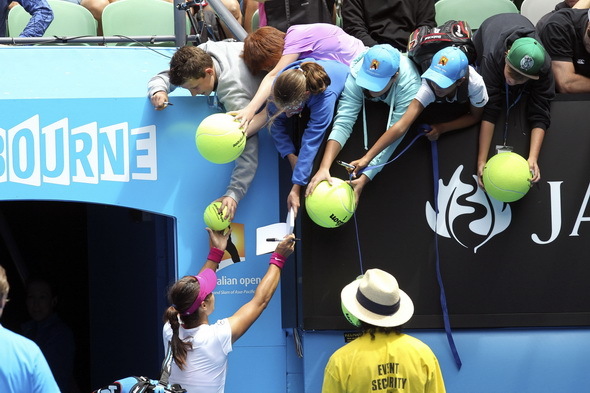 But when Li Na showed up, things started to change. Just as Yao Ming whipped up a basketball fever, Li has continuously inspired the new generation of tennis players in her hometown as well as in the country. “But I usually told them Li Na is rare and unique,” she said.